Misfit Industries recently released its new motorcycle front floorboards for baggers and Harley Davidson models. The new line of custom Harley front floorboards is called the Monarch series. 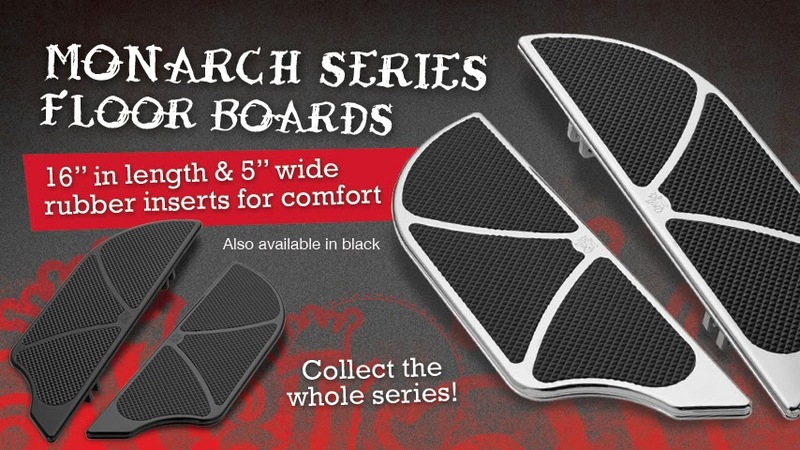 The Monarch series are custom front floorboards that fit the OEM mounting points allowing easy customization by anyone. There are many bagger floorboards on the market today, but these are unique. The contoured shape and clean lines demand attention which separate Misfit products from other brands. The rubber inserts allow any biker to ride in comfort. At 16” long and 5” wide these custom front floorboards will make any bike stand out. As always bikers can ride with confidence because the floorboards come with the Misfit Industries Lifetime Warranty. The new Harley floorboards come in chrome or black anodized, and fit all FL & FLST models. The Monarch series also includes passenger boards in the same shape and finish. The passenger floorboards have the same rubber inserts and measure 9.75” long x 4” wide. The floorboards are adjustable on the width up to an extra 1” out. Monarch series rear passenger pegs, brake arms, and shift arm kits are also available in chrome or black anodized. Some bikes are built for show, while others are made to ride. The Monarch series was created to look great and perform even better. Misfit Industries is proud to produce the best custom parts made in the USA. Innovative design and the highest quality materials are used in every original Misfit part, which is why the product is backed a Lifetime Warranty. For more information call 877-647-3489 or visit the website at www.MisfitIndustries.net.